Promotional value expires 90 days after purchase. Amount paid never expires. Not valid for Kids Yoga. First class activates this voucher pass at Modo Yoga Orleans; purchaser’s first class must be taken before expiration date on voucher. Activation required by expiration date on voucher. 2-month pass expires 60 days after activation. 10-class pack expires 90 days after activation. HST not included, payable to Modo Yoga Orleans at time of redemption. Registration required. Limit 1 per person, may buy 1 additional as gift(s). Valid only for option purchased. All goods or services must be used by the same person. Not valid for clients active within the past 12 month(s). Valid only at listed locations. Merchant is solely responsible to purchasers for the care and quality of the advertised goods and services. Be Accessible: The studio—an inclusive space for yogis of all abilities, ages, ethnicities, and sexual orientations—offers a wealth of hot-yoga classes. 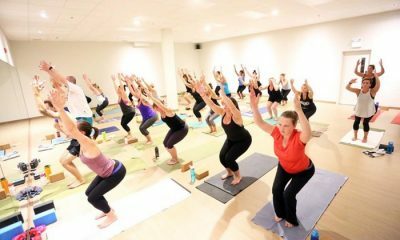 By combining therapeutic and traditional yoga techniques, as well as individual attention, Modo’s instructors ensure each practitioner can safely make the most out of every session. Live Green: Making the world a better place also means looking after it, so sustainability is at the heart of each studio location. Renewable resources, like wind- and solar-power generation and ethically harvested cork floors are just the beginning of Modo Yoga’s green living platform. Community Support: Modo is committed to not only supporting its members but the larger local and global community. Each year, through by-donation Karma classes, the studios raise over $350,000 for charities like Big Brothers, Big Sisters and the David Suzuki Foundation.